The Here And There Art Walk with Woollen Woods in Belper, Derbyshire. During the weekend 23rd – 25th May 2015 the Here and There Art Walk is due to take place in Belper Parks wood in Derbyshire. Artists of all kinds have been encouraged to join in with this event and artwork should be popping up amongst the trees for all to see. Rather than getting out my pen and paper I’m joining in with the yarn bomb inspired by the Woollen Woods event taking place countrywide. All manner of knitted woodland creatures will be taking up residence in the branches and it’s sure to be a welcome sight for any families, dog walkers or art trail visitors. Unfortunately my contribution is rather tiny at the moment. I’ve got no excuse really, I just keep forgetting to knit! In fact my knitting has been so slow to progress, that you might be forgiven thinking I was trying to break some kind of world record for the slowest growth of stitches! I have contributed a mouse so far (he’s quite small though) and I’ve been knitting a squirrel forever, so long in fact that I thought he was a fox until I double checked the pattern and realised I’d forgotten what I was making. 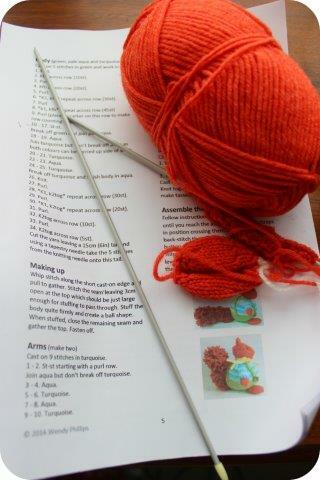 At this rate I really should be knitting a snail! If you want to get involved (and you’re faster than me) there’s still time to knit, crochet or otherwise combine textiles to be included in the woods. All you need to do is get in contact with the Yarn bombing organiser Anne Clark of Anne Clark Handmade and I’m sure she’d love to see your efforts. If you don’t fancy getting involved with making any of the creatures then do pop along to see them all in situ, hopefully the weather will be good but the knitting should be at least partially protected from any rain under the leaves and branches.